The story of one family’s mission to change the way we see the world. It was the stars of the silver screen in the 1930s who gave sunglasses their glamorous image. The 1950s and 1960s heralded a fashion revolution. Alongside the new found freedom to express ourselves through style and clothing came the demand for sunglasses that turned heads. And that meant eyewear from Oliver Goldsmith. 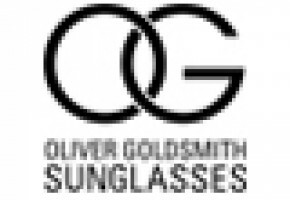 Oliver Goldsmith has been a family-run business for over 80 years. Founded in 1926 by P. Oliver Goldsmith, the world of spectacles was about to be revolutionised. Think 20th Century icons. Michael Caine in his signature black spectacles. Audrey Hepburn in the big white glasses that framed her elfin face. Think cult films – The Ipcress File and Harry Palmer, Charade and Two for the Road. They’ve all got one thing in common. Oliver Goldsmith. In the second half of last century, when it came to eyewear, Oliver Goldsmith was synonymous with stars and style. Twenty years after Oliver Goldsmith ceased production of sunglasses Claire Goldsmith, a new fourth generation, felt the time was right to bring back the individual style and quality that epitomised this iconic brand. In the short time OG sunglasses have been back, celebrities and royalty alike have again embraced the classic timeless designs. Every year, OG select a number of frame designs from the vintage archive to form a collection. These frames are chosen from a range of 400 classic designs dating back from the glittering 1940s to the expressive 1980s. Now worn by Robbie Williams, Kylie Minogue, Jude Law, Gwyneth Paltrow and the new Queen of Jordan, Oliver Goldsmith has gone full circle, from catwalk to catwalk, from Soho in the 1960s to Notting Hill today, from Oliver Goldsmith to simply, By Goldsmith.